Veterinarian, Donna Terris, at the Massapequa Pet Vet, said that a Good Samaritan brought in a litter of 5 week old kittens abandoned by their mom. 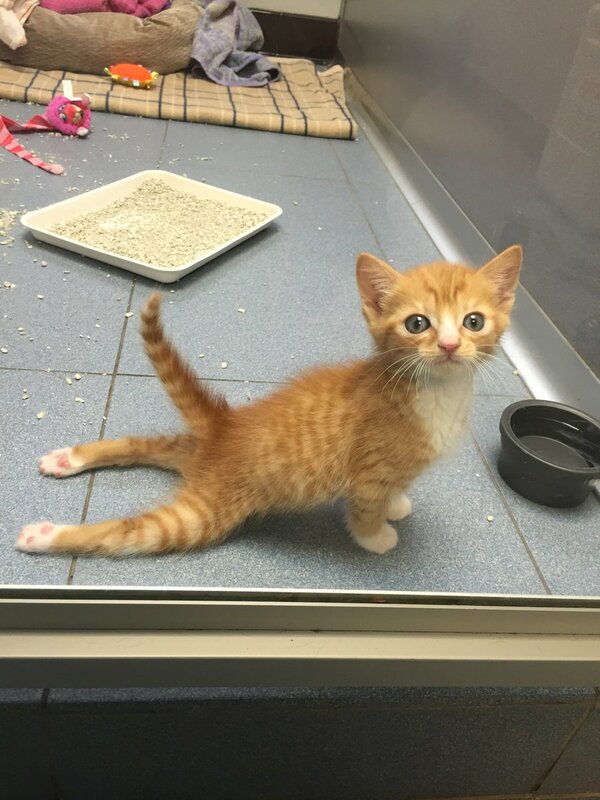 Each kitten was quickly adopted, except one that was paralyzed from the waist down and unable to walk. The staff at the Massapequa Pet Vet named the remaining cat Mac N'Cheez, or Mac for short. He had reportedly been brought to them in a macaroni and cheese box. To better help the paralyzed kitten settle into his temporary home, technicians even constructed a make-shift wheelchair out of K'NEX or Erector set toy pieces. In a video by the Massapequa Pet Vet, Mac can be seen taking his first "steps" as they fastened the K'NEX/Erector Set wheelchair to his hind legs. Mac and Cheese quickly discovered he had a penchant for speed, whizzing off on his new set of wheels and basking in his new found mobility. The toy wheelchair has been confused as a "Lego Wheelchair", but you can clearly see that they are not Lego. It is most likely K'NEX or Erector set toy pieces. Also, this should not be confused with the recent Lego Wheelchair the toy company came out with in January of 2016. That's when Lego unveiled their first disabled figure. The company later confirmed the tiny wheelchair will be part of the new Lego City set that will come out in the June of 2016. Doctors are still unsure why Mac's legs aren't working. They are not broken and there doesn't seem to be a physical reason they currently won't work. The wheelchair is the first step to recovery. Mac has also started swimming in a little pool to hopefully stimulate and help rehabilitate his hind legs. Mac does respond to squeezes and seems to be able to feel pain on some parts of his hind legs - indicating that the hospital may be able to help him walk again. Horowitz said Mac could be walking on his own within a few weeks and may soon be ready to find his forever home. In the meantime you can follow Mac and Cheese's adorable zooms on the Massapequa Pet Vet Facebook page.